NORTHRIDGE, California – As in years past, HARMAN Professional audio components played a crucial role in the live sound reinforcement system at the 54th Annual GRAMMY® Awards, held February 12 at the STAPLES Center in Los Angeles. ATK Audiotek provided live sound reinforcement at the venue, relying on JBL VERTEC® line arrays and AKG microphones. The annual GRAMMY Awards telecast, known as Music’s Biggest Night®, is presented by The Recording Academy® to honor outstanding achievements in the production and performance of recorded music. This year’s awards featured performances by some of the biggest names in the music industry, including Bruce Springsteen, The Beach Boys, Bruno Mars and others, highlighted by a special tribute to Glen Campbell. Adele earned multiple GRAMMY Awards, including Song Of The Year and Record Of The Year for “Rolling in the Deep,” and Album Of The Year for 21. This year’s GRAMMY Awards also featured performances by HARMAN’s JBL “Hear the Truth” campaign artists Paul McCartney and Maroon 5, while HARMAN artist Kanye West won four awards. ATK Audiotek provided the main PA system, which featured four arrays each containing 12 VERTEC VT4889 fullsize line array elements, plus two arrays of six VT4880A fullsize arrayable subwoofers each. An additional 12 VRX932 Constant Curvature loudspeakers were used for front fill. 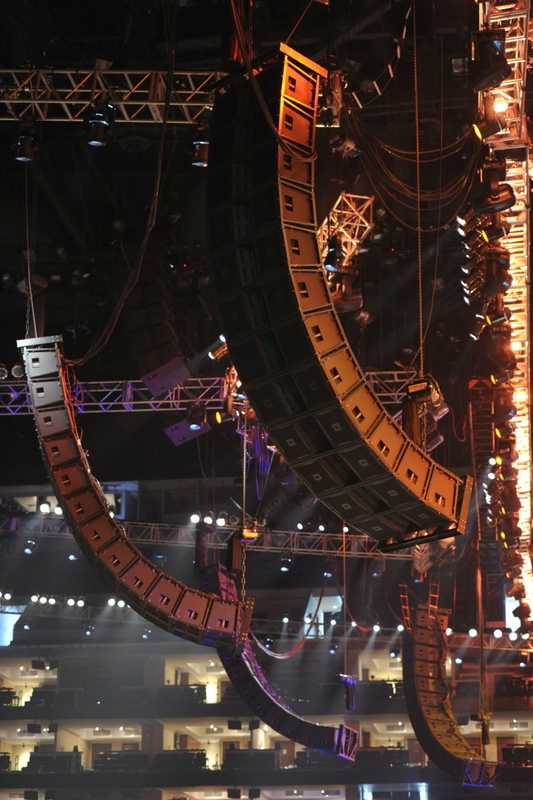 The STAPLES Center also features a newly installed JBL VERTEC line array system, which ATK Audiotek utilized in addition to some temporary components. The STAPLES Center system features eight arrays each containing between 11 and 13 JBL VT4889DP-DA powered line array elements, plus two fill clusters each containing four VT4889DP-DA elements, which are specially positioned to cover the end seating areas. 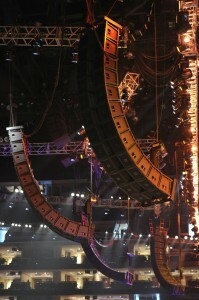 The system also features four subwoofer arrays, each containing six VT4880A fullsize arrayable subwoofers. ATK Audiotek also equipped all three pianos on stage with three AKG C414 microphones each. The pianos were featured in multiple performances throughout the GRAMMY Awards, including performances by Diana Krall, Jennifer Hudson and Alicia Keys. Rusty Anderson, who played guitar during Paul McCartney’s performance, used an AKG DMS700 digital wireless system in his guitar setup, while Chris Brown used a Crown CM311 microphone for vocals. HARMAN (www.harman.com) designs, manufactures and markets a wide range of audio and infotainment solutions for the automotive, consumer and professional markets — supported by 15 leading brands, including AKG, Harman Kardon, Infinity, JBL, Lexicon and Mark Levinson. The Company is admired by audiophiles across multiple generations and supports leading professional entertainers and the venues where they perform. More than 25 million automobiles on the road today are equipped with HARMAN audio and infotainment systems. HARMAN has a workforce of about 13,000 people across the Americas, Europe and Asia, and reported net sales of $4.2 billion for twelve months ending December 31, 2011.